For anyone who has lost teeth or has had missing teeth replaced by removable dentures or bridges, dental implants can provide a stronger, more secure alternative. We offer dental implants at Chingford Dental practice both our London dental practices. The dental implant procedure normally comprises two steps. During the initial step, a titanium screw which will eventually act as a substitute tooth root and anchor for the replacement tooth, is surgically inserted. 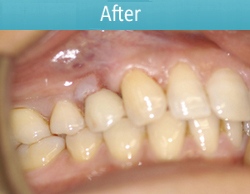 The second step, in which the artificial tooth is attached to the new root, takes place once the jaw bone and the gum tissue surrounding the titanium screw have healed. The artificial tooth that is used as a replacement is carefully crafted to match your natural teeth in size, shape and texture, allowing it to blend discreetly with the remainder of your teeth. The titanium anchor holds the tooth securely and strongly in place, providing an artificial tooth that functions completely naturally. 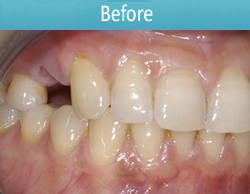 While dental implants are wonderfully effective, not every patient is a good candidate to receive them. Dental implants require the patient to undergo surgery to have the titanium anchor placed, so the candidate needs to be in relatively good general health. They also need to have healthy gum tissue and sufficient bone density to support the titanium anchors.